Unlike with Penman Sapphire, I haven't made any concerted effort to collect Emerald alternatives but it just happens that I had collected a few of the suggested alternatives! I have swatched a few of these and some additional greens from my collection and those that have been the most similar I inked into medium nibbed pens for a better comparison. Emerald is a pretty wet ink and it holds up well with Bungubox Norwegian Wood (Sailor inks, of course, being, generally, very wet inks). KWZ Green #3 and GvFC Moss Green are all decently wet inks as well. In general, all the inks performed fairly similarly in terms of wetness, lubrication, daytime and water resistance. None of the inks had a halo, and none of them feathered on friendly paper nor did they bleed. Good performers all round. Shading was moderate to high across the range with KWZ Green #3 having a decent amount of shading on every line. As mentioned above, the amount of shading was less in the Penman Emerald but the contrast of what shading was there was pretty high, and probably the highest of all the inks. Parker Penman Emerald is a highly saturated green that leans slightly yellow. It shades moderately but the contrast can be very high. All the inks are pretty saturated, but Penman Emerald is definitely the highest. Although the ink can get pretty dark (especially when left in a pen), which somewhat obscures the colour, the green colour is a highly vibrant green (when the shading permits the green to shine through). By comparison, Norwegian Wood has less green and slightly less vibrancy and Moss Green takes it a step further being noticeably less yellow and vibrant than Penman Emerald. Green #3 has a similar yellow base colour but misses out on the darkness of Penman Emerald. The inks did differ with their sheen with Penman Emerald offering a somewhat subtle amount of, but still visible, red sheen. Here is where Bungubox Norwegian Wood takes a major turn away from Penman Emerald in that it's offers a decent amount of silver sheen. Moss Green also offers a red sheen like Penman Emerald and the sheen a little more prominent as well. 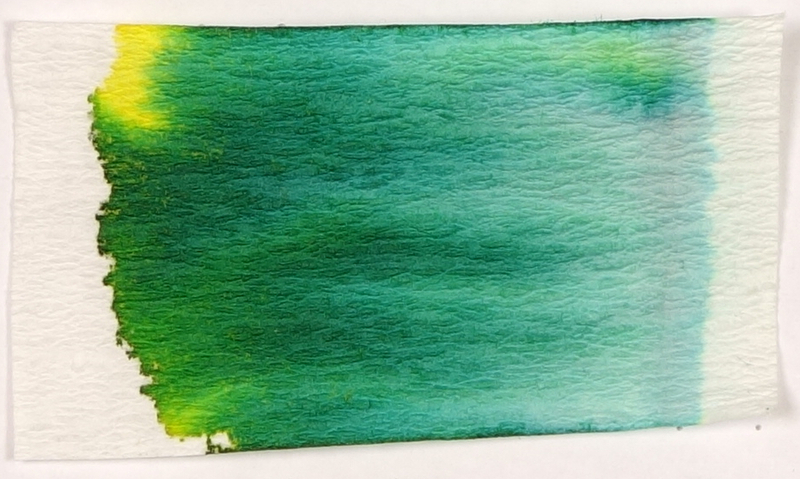 KWZ Green #3 also offers a silver sheen like Norwegian Wood, but it's much less visible. Interestingly, the chromatography shows a lot of yellow in the Norwegian Wood but that yellow doesn't come out as strongly as it does with the Penman Emerald (which shoes a rather flatter chromatography). All the inks have blue separating in from the green. Penman Emerald and Green #3 share a similar order with the blue coming out above the green - Green #3 shows a similar hue to Penman Emerald as well but is lighter in every way. Moss Green and Norwegian Wood have the blue more prominent and has the green breaking away from the blue above. All the inks take around thirty seconds to dry on Rhodia 80gsm paper. That's a decent amount of time but not abnormally slow. Penman Emerald seems to be the most readable after water has been spilled. In the top crosshatch the water is dabbed away quickly and in the lower is is left for a minute to soak before being dabbed away. You can clearly still identify the lines in both examples of Penman Emerald but I wouldn't describe it as resistant. The Moss Green is barely identifiable but none really I wouldn't classify it has water resistant at all. Neither with Norwegian Wood nor Green #3. Left to right: Diplomat Excellence A 'M' (KWZ Green #3), OMAS Arte Italiana Paragon Arco Celluloid 'M' (Graf von Faber Castel Moss Green), Lamy 2000 'M' (Bungubox Norwegian Wood/Emerald), and Parker Duofold International 'M' (Parker Penman Emerald). I really do love Parker Penman Emerald. More than Penman Sapphire even. 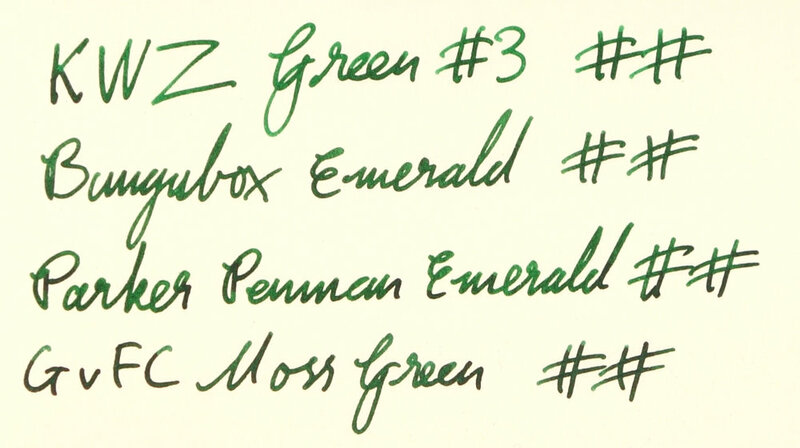 I'm not huge fan of green inks in general but this is high on my favourite inks list (if that existed). I feel like with Penman Sapphire the alternatives are decent enough to not need the original but with Emerald, and much like Lamy Dark Lilac, accepting an ink as an alternative really relies on which compromises you abide by. If you want the colour to me similarly yellow leaning, but don't mind the ink being lighter perhaps KWZ Green #3 is a viable option, if you don't mind the colour people a little different but the sheen to be comparable, Graf von Faber-Castell Moss Green might the best option. And if the darkness and richness of the ink is the most important feature, perhaps the Penman Emerald inspired Bungubox Emerald (Norwegian Wood) is best. For me I'm just relieved that I don't have to make such a compromise. If forced to, I'd probably pick KWZ Green #3 simply because I do prefer yellower greens. If you ever see Parker Penman Emerald within your price range, I highly recommend picking it up. Bellow I have included these four inks on various papers and some extra swatches. At this point I'd like to also comment on Diamine Sherwood Green. This ink is definitely leaning more blue than Penman Emerald and when wet is rather dull and much bluer. 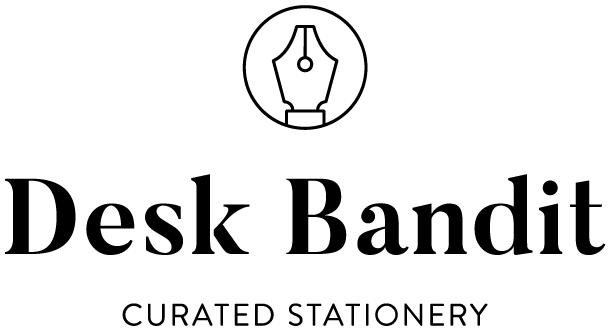 This is often an ink that is recommended as an alternative. KWZ Iron Gall Green #3 is also an ink that might be comparable (but is not included in this comparison) it dries darker (due to oxidisation of the Iron Gall element of the ink) than the standard KWZ Green #3 and is still yellow leaning. You can follow @macchiato_man on Twitter for blog updates.